make choosing what’s right for you a little overwhelming. It’s easy to find a signature fragrance when you know what types of scents you find appealing. Perfume makers have their own terminology and categories to classify products, the list goes beyond common abbreviations such as EDC, EDT and EDP. We will try to break the theory of olfactory into small chunks that are easy to swallow. What Are Those Different Scent Types? Generally speaking, colognes scent types fall under three distinct categories. These categories become important when pairing your clothing and personality with a scent. Spicy Scents create a leathery, seasoned effect. They are deeper, and thus require a more rugged outfit. Think: facial hair, leather jackets — something a little on edge to match your lingering cologne. The legendary example is Old Spice; remember that manly man on the horse commercial? If you want something new, try Obsession for Men for the same effect. 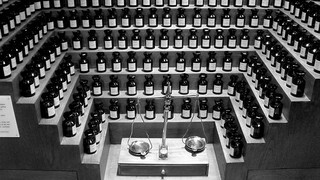 Check below the video guide from Givaudan’s Perfumery School for some comprehensive information on different scent types as well as perfume notes, which we will be discussing just in a minute. So, you’ve chosen your best smelling cologne, and you’re ready to spray. But be prepared: this one spray has an incredibly unique lifespan, one that will change, create depth and, finally, fade away. Now we are ready to move on with our short study… so let’s check what are the fragrance notes that everybody is talking about. So, let’s start from the first spray. The first spray creates the “top notes” of the cologne lifespan. It’s the most romantic of the life of your cologne: it’s strong, fleeting, and does not lend a great basis for the lasting scent of the cologne. But, boy is it magnificent at the outset. The “middle notes” of the cologne burst out as the top notes start to fade: they are still strong, but not quite as strong as their forefather top notes. They’ll linger until they begin to assemble the core of the cologne’s scent. And finally the middle notes will descend into your “base notes”. These are the notes that will stick with you tried and true till the very end. They give that lasting memory, that personality at the core of the cologne. They are rich and provide depth and emphasis to your scent. All three types of colognes: your green, citrus, or spicy scents, depend on these three notes for their core strength.